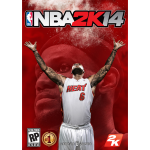 We’re wrapping up another week here at the NLSC with a couple of file additions for NBA 2K14 PC. Today’s new releases include a 2017 Draft Class, and a face pack for Jerian and Jerami Grant. Download them both at the links below!